Connects to the Internet, Analyzes Data, and Processes Information. Our pilot project is a proof of concept launched in 2016. JoGo is equipped with state of the art Motors which allow for 25 Degree of Freedom. Welcome to NueRobotics, a Dubai based firm specializing in Robotics. We aim to build social robots that become an essential part of our every day life. Our goal is to create robots that have unique personalities, that can provide social companionship and provide automated access to online information. Our vision is that robots will be able to learn new things, play games, welcome guests, present, advise on useful information, entertain, serve drinks, keep a secure eye on a property against intruders. We believe that robotics and artificial intelligence has a place in every future business and home, we plan on playing a major role in making that future a reality. 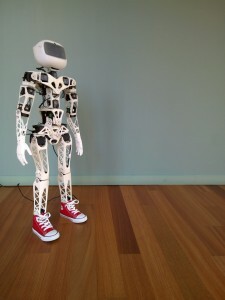 To improve your quality of life with social robots. Become a pioneer in innovation, research and production of personal social robotics. *Disclaimer: JoGo Pilot is based on the open source 3D printed Robotic Platform The Poppy Project created by Inria Flowers.